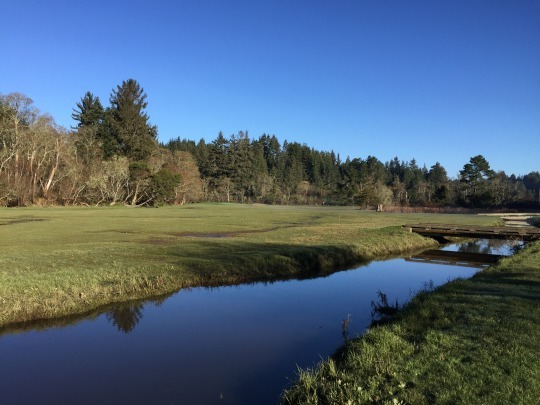 This course has been kind of a nemesis for me ever since I officially declared myself a “course collector.” It’s not far from my hometown of Crescent City and it’s one of only a handful of 18-hole regulation courses in the far northern region. However, the timing never really worked out for me to play it while driving through Eureka. I am quite certain that this was just a 9-hole layout when I was younger, and that’s one reason I never put too much of a priority on playing it when I started collecting courses. I don’t know when a second nine was added or if I was just wrong about thinking it was only a 9-holer. It doesn’t matter now because I finally checked it off the list! 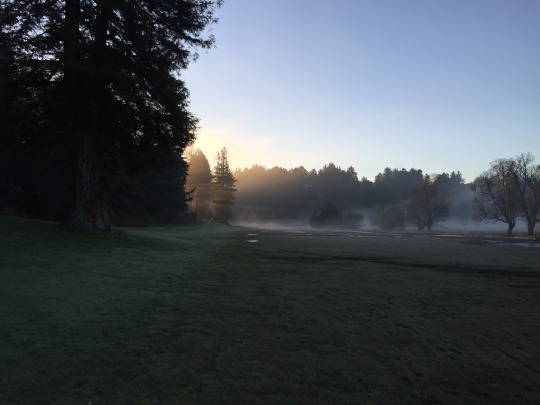 Last year, my attempts to play here were thwarted by a major frost delay on one of the few days it was not raining. I expected some of the same issues for Wednesday morning because no rain was in the forecast, so I called ahead. 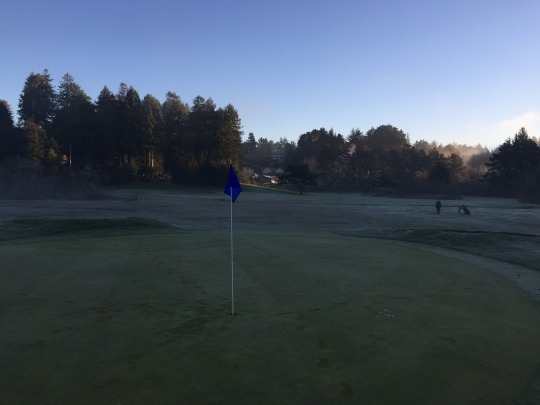 The lady in the pro shop did tell me that any frost delays likely wouldn’t be that long. However, she was honest and let me know the course was in rough shape after some heavy rains and a lot of flooding. She also let me know it would be walking only. I know this course is prone to flood in the winter. I was still determined to play it and it ultimately worked out. 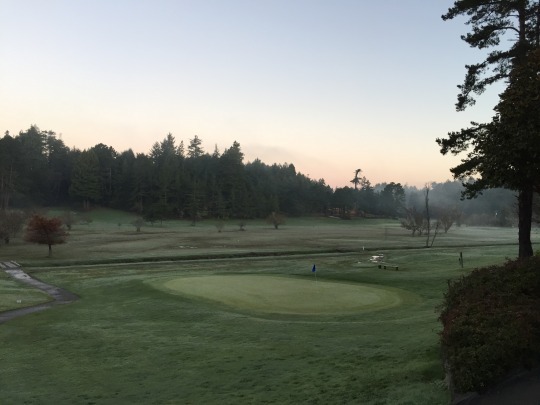 There was some frost on the ground when I arrived, but there was no frost delay. They charged me just $10. There was actually one single out ahead of me when I teed off at 7:40, but he skipped holes 3-4 on the front nine (the most flood-damaged holes) and didn’t play the back at all. So I basically had the place to myself that early in the morning. Plenty of players were out by the time I finished, most wearing thick layers and some wearing rain boots. 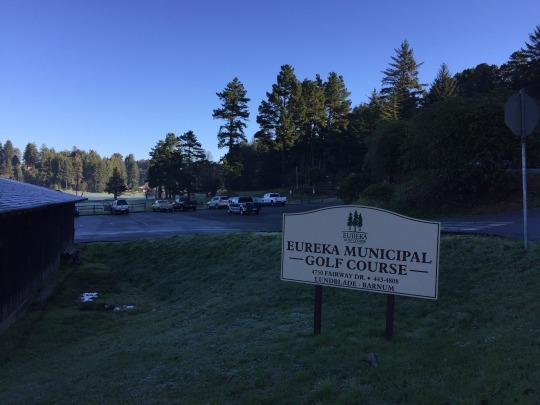 Welcome to winter golf in Eureka! The course was indeed a sloppy mess, which presents its own kind of fun. There was actually pretty good grass coverage throughout. It’s just that the ground underneath was mush and they haven’t been able to mow the grass anytime too recently. So it is all very shaggy and muddy. Then, there were still a lot of frosted-over spots, too. Just walking the 18 holes with a bag on my back was tough, and then trying to play golf in these cold/wet conditions was a little silly. I still managed and it’s not the first time I’ve played in similar conditions up in this area over the winter. It’s all part of the fun. Condition-wise, I will say the greens were in pretty nice shape all things considered. 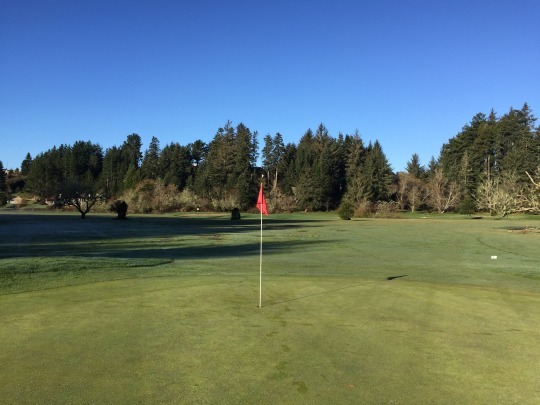 They were of course very soft and slow with the moisture on top, but the surfaces were fairly well maintained despite all the factors working against the greenskeepers. As for the layout, I enjoyed it for the most part. 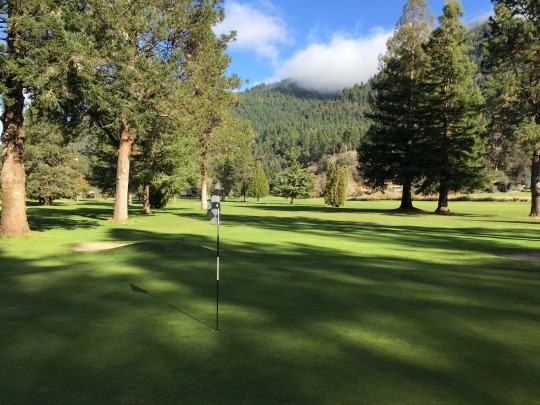 The course was designed by Bob E. Baldock and definitely reminded me of my hometown track, Del Norte GC. 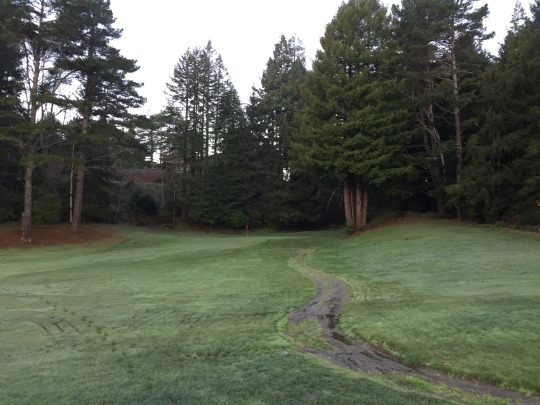 Much of the course sits in an open valley with some creeks and drainage ditches cutting across to provide some hazards. 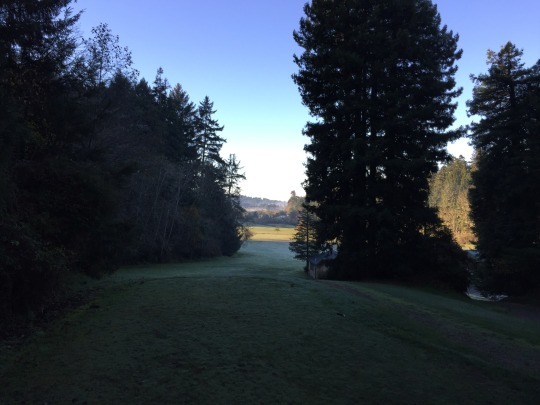 Then, other parts of the course run along and up into the redwoods. 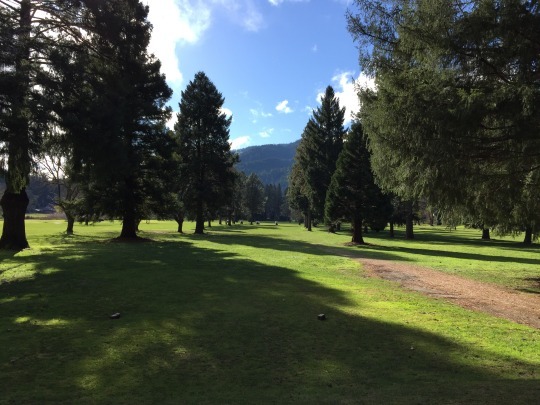 Some of these holes are a little quirky (narrow angles and sharp doglegs) and the big trees are very much in play, but they sure provide a beautiful setting. 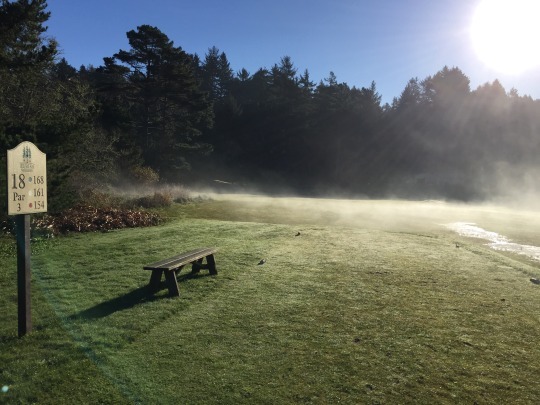 With the clear skies, some frost on the ground and some fog/steam rising, everything looked eerily beautiful and I got some cool pictures. I really liked two of the par-3s (8 and 12), which are similar in style. 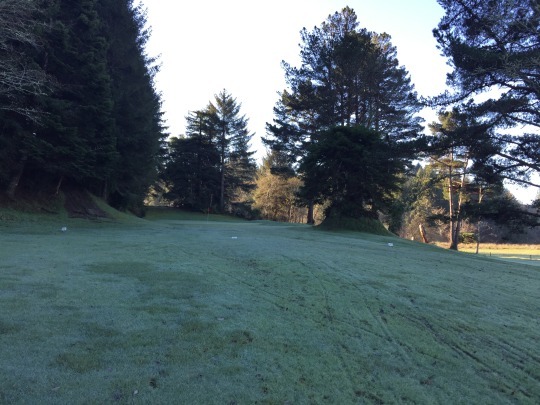 They both have elevated tees and play through somewhat narrow openings in the trees. 12 is a very short hole (114 yards from the blues) and 8 is a little longer (156 yards). The whole course is relatively short (par-70 topping out at 5,674 yards). It certainly played much longer with the wet conditions, though. My favorite hole was the par-4 11th. 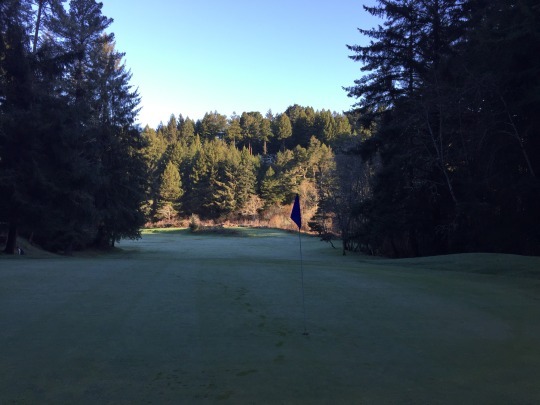 It features an elevated tee tucked back amongst some redwoods. The gap for the drive feels extra tight (especially for a fade hitter like me). It opens up in a valley after that and then the hole goes back uphill for the approach to a green also set in a grove of trees. I’m sure I’ll end up playing here again someday, probably in the summer so I can experience better playing conditions. For now, I am glad I finally checked it out. 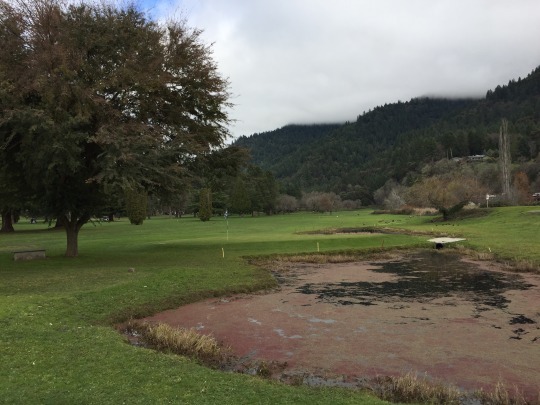 Depending on what time of year you are in the area (most tourists visit the redwoods in the summer anyway), it’s a solid enough course to play. 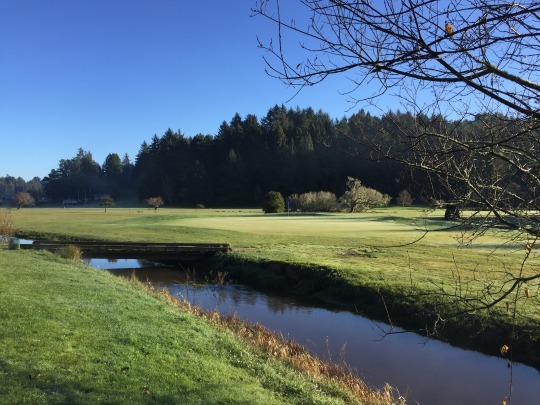 Beau Pre in nearby McKinleyville is a better course and so is Baywood Golf & CC if you can access it (both are also 18-hole regulation layouts), but Eureka is a fine, friendly muni option that will give you a nice taste of golf in the redwoods. This falls into the category as one of the more entertaining names for a golf course. That said, this course is also known as Willow Creek Golf & CC, depending on where you look online. The signage at the course and the scorecard still say “Bigfoot” and that’s what I’m going to stick with because it’s awesome. Why Bigfoot? Well, if you didn’t know, Willow Creek is one of the central places associated with the legend of sasquatch. That original grainy film footage (that is still debated as real or fake to this day) was filmed near this remote mountain town. There is a Bigfoot Museum in town, there are wood carvings and drawings everywhere, and just about every business here is named after or represents Bigfoot in some way. In fact, I was excited to finally eat a famous Bigfoot Burger at the the Early Bird restaurant. I was bummed when I showed up and they were already closed down for the holidays! There just aren’t many tourists in town this time of year. This was another course that was bugging me. 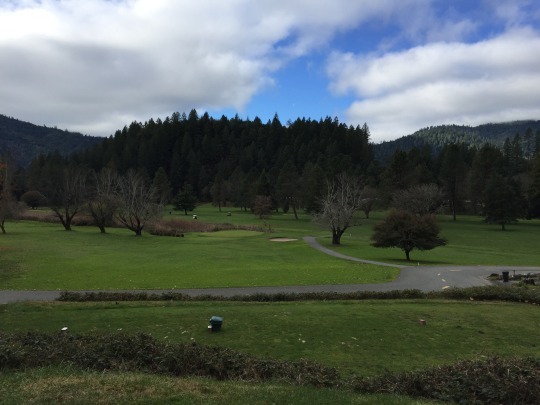 I tried playing here last year, but Willow Creek is well out of the way (about 40 minutes off the 101 Highway from Arcata). I tried calling the course then and got no answer, so I wasn’t going to risk the drive out with any uncertainty. This year, I called again and got no answer. However, I still had most of the day ahead of me and decided to make the drive anyway. At least I could get a Bigfoot Burger, right? Well, the burger didn’t work out, but the course did. 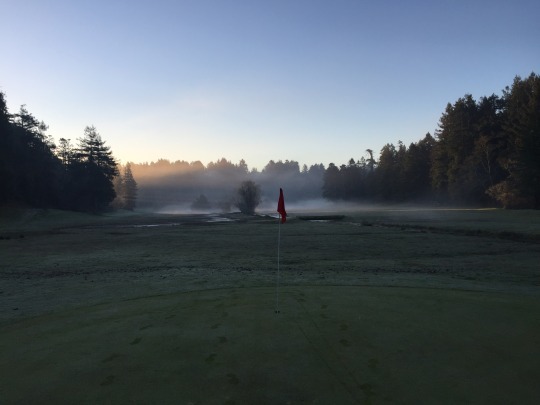 I saw flags on the greens and a handful of players on the course, so I at least knew it was open for play. 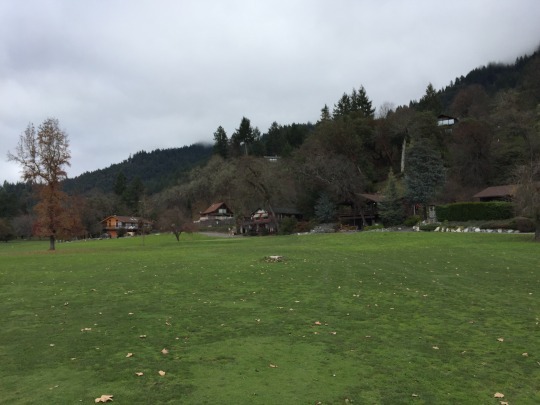 The pro shop area was a ghost town, though. I found a cabinet outside that had scorecards, pencils and envelopes. Basically, it’s the honor system this time of year. 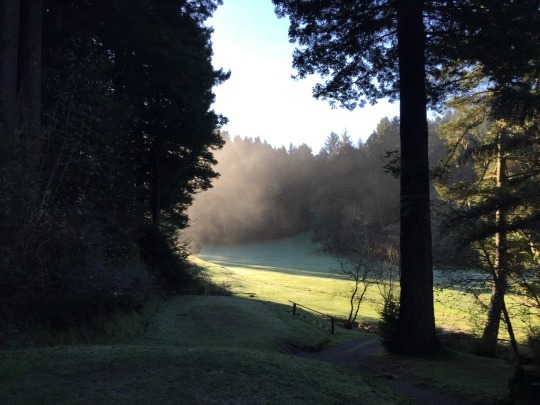 Drop your money in an envelope ($15 for nine holes, $20 for 18) and stick it in the mail slot on the pro shop building. I followed those instructions and headed to the first tee. I did catch up to the other players eventually, but I was still able to walk the nine holes in a little over an hour. 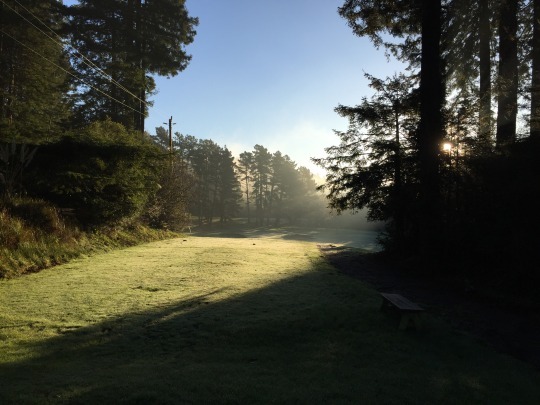 Bigfoot is a 9-hole course, but it is of regulation length. It is a par-35 layout that maxes out at 2,559 yards from the back blue tees. They recommend you play the blues on the front and the whites on the back for a full 18. 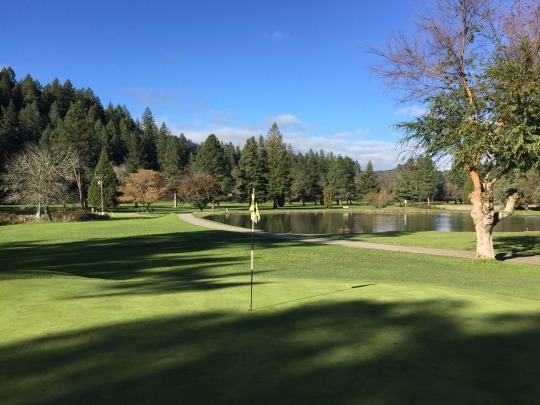 The setting and name are ultimately more interesting than the course itself, but it’s a solid nine holes. 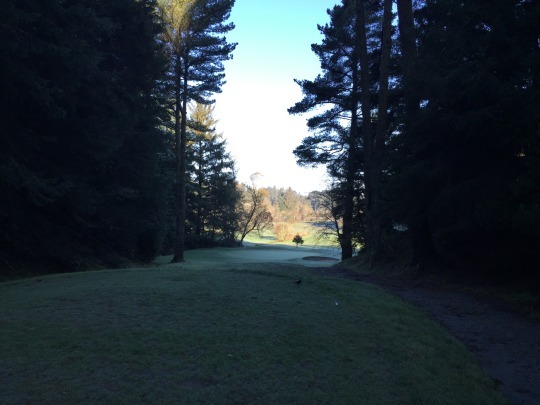 Some holes are more open while others are quite narrow with tall trees flanking either side of the fairways. Then the greens are tricky because they are very small and “tortoise shell” shaped. They are crowned in the middle and fall off on all sides. The mountains, trees and rustic mountain homes provide a very pretty setting. Unfortunately, there were no sasquatch sightings for me. I kept my eyes open, though! 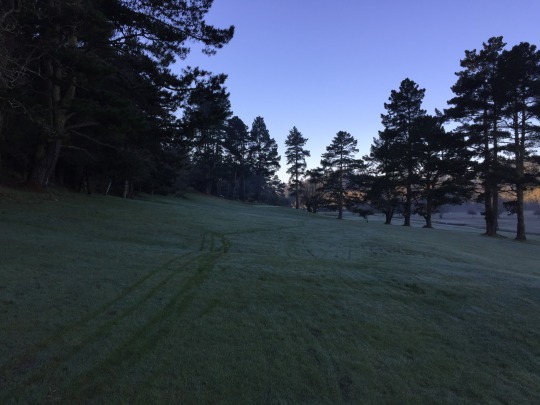 Conditions were decent and the solid footing was very welcome after my squishy morning round in Eureka. The tee boxes were fine. The fairways had pretty solid coverage, maybe a tad on the shaggy side. The rough was kind of a mix of grass and different weeds, but it was cut consistently and green in appearance. In other words, it looked better from a distance. 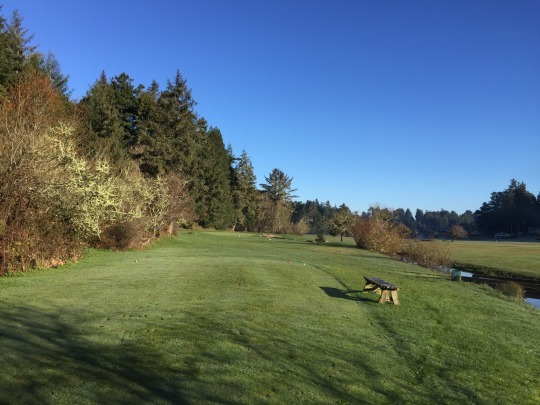 I will say there is probably not one square yard of turf on this entire course that is not littered with goose poop. It’s amazing how prolific and thorough those birds are. That was a bit gross and unpleasant to walk through. I was in one bunker. The sand was decent, but there was no rake. 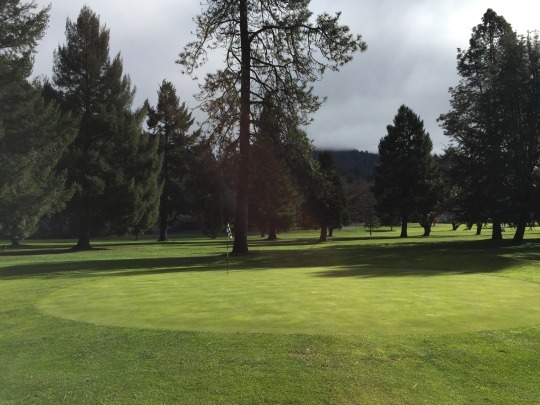 The greens were firm-ish and rolling rather quickly–surprisingly nice. Bigfoot is a fun one to say I’ve played. 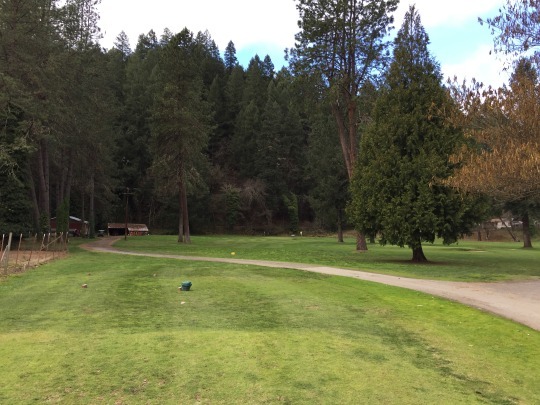 It’s not worth going so far out of the way just for this course, but if you are rolling through town on Highway 299 or you are visiting the area for some squatchin’, it’s a decent place for a quick and easy round.